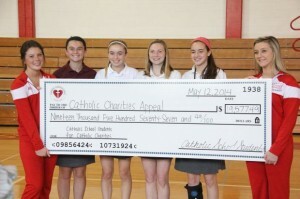 Students of St. Anastasia School in Newtown Square (four girls center) represent their school, which raised the most money in the "Catholic School Students for Catholic Charities" fund drive among all grade schools in the archdiocese. 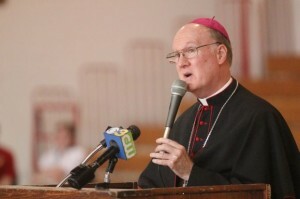 Auxiliary Bishop Michael J. Fitzgerald, who oversees Catholic education in the Archdiocese of Philadelphia, welcomed more than 100 students from schools throughout the archdiocese to Archbishop Carroll High School May 12 in celebration of their hard work to raise funds for the four schools of special education in the archdiocese. 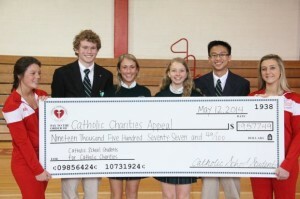 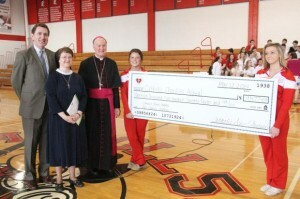 The “Catholic School Students for Catholic Charities” fund raising event this year saw Catholic school students in the archdiocese raise $19,577 through the Catholic Charities Appeal for Archbishop Ryan Academy for the Deaf, St. Lucy Day School for Children with Visual Impairments, St. Katherine Day School and Our Lady of Confidence Day School. 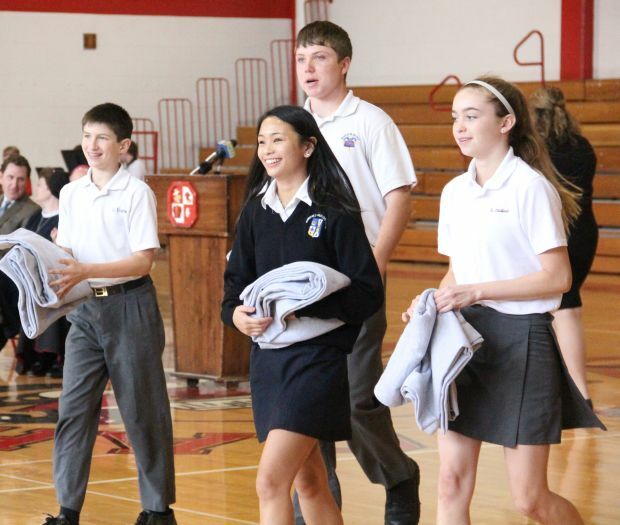 Participating students came up with creative ways to get donations such as dress down days, a kickball tournament, arts and crafts sales and an Easter basket raffle. 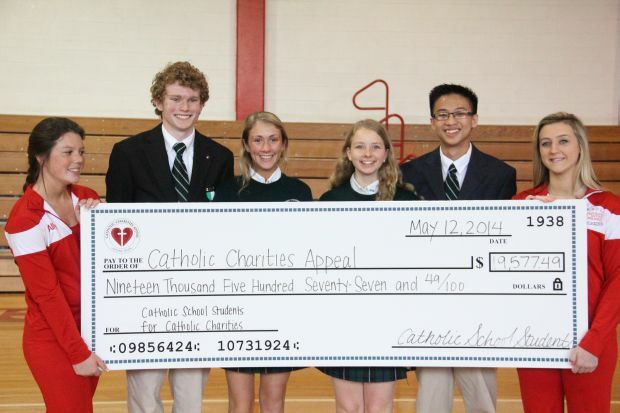 Students from Bishop Shanahan High School, Downingtown, raised the most money of all the archdiocesan high schools in the fund raiser. They stand with cheerleaders of Archbishop Carroll High School with a replica of the check shown at the assembly. 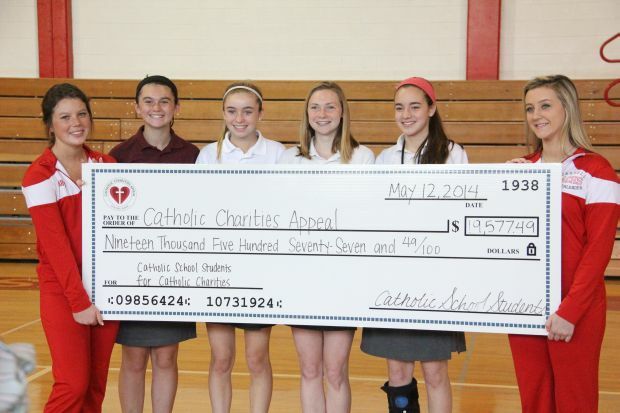 Students of St. Anastasia School in Newtown Square (four girls center) represent their school, which raised the most money in the “Catholic School Students for Catholic Charities” fund drive among all grade schools in the archdiocese. 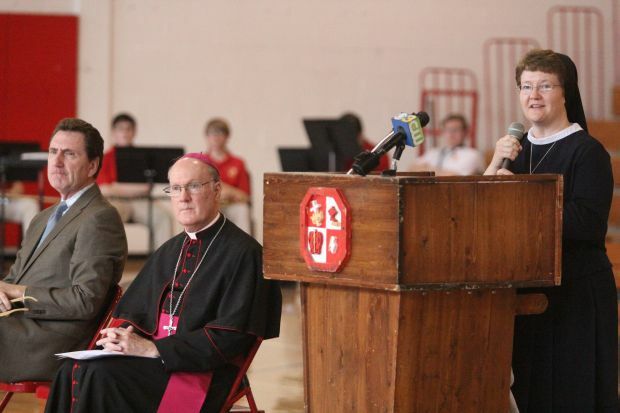 Sister Lisa Lettiere, I.H.M., speaks at the assembly as Bishop Michael Fitzgerald and Francis Fox, principal of Archbishop Carroll High School, look on. 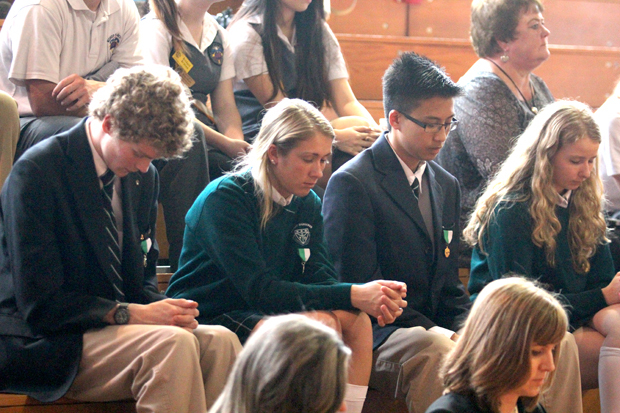 Students at the assembly take a moment for prayer. Bishop Michael Fitzgerald speaks during the assembly. 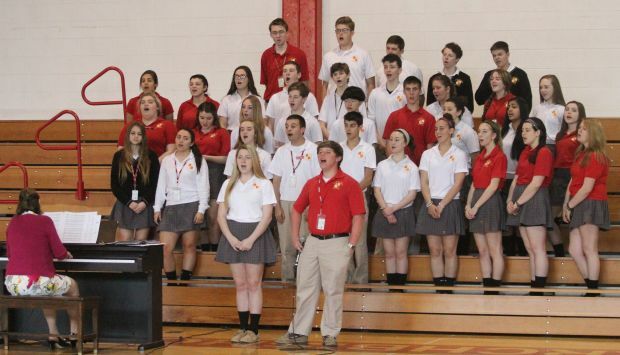 The Archbishop Carroll choir sings during the assembly. Students participate in the assembly. 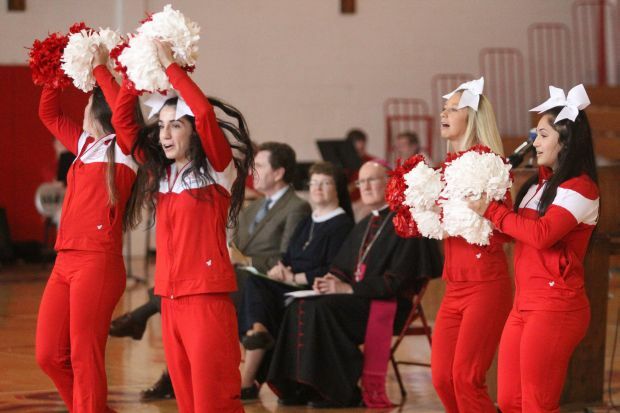 Archbishop Carroll cheerleaders add to the fun spirit of the “Catholic School Students for Catholic Charities” event. The jazz band of Archbishop Carroll High School performs.